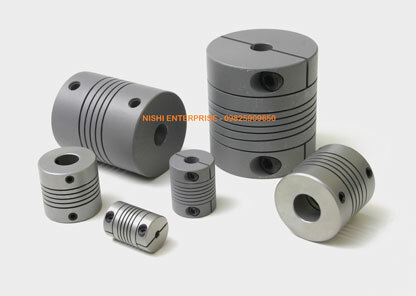 Nishi Enterprise is a recognized designer and manufacturer of top quality bellow couplings and spares that can be used for a wide range of industrial applications. Bellow couplings are a type of flexible coupling that is known for their high level of operational efficiency and accuracy. The key benefits that are obtained from using bellow couplings include precise transmission of the velocity, compensation of misalignment as well as superior torque and angular positioning. The bellows couplings stand out for their superior torsional rigidity that offers the flexibility needed for dealing with the angular, parallel and axial shaft misalignment. 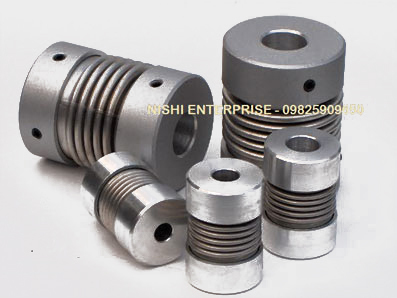 At Nishi Enterprise, we have highly developed industry expertise that we can use to create advanced bellow couplings and spares for your specific needs. We can create traditional metal bellow couplings which are known to be extremely robust and versatile. Some of the major features of our products are superior transmission of torque and high torsional stiffness. We can also deliver you products that can ensure excellent compensation of axial, radial and angular misalignments. The best thing about our products is that they can be assembled and used easily. The high level of operational safety guaranteed by our products makes them perfect for different kinds of applications. Based on your specific needs, we can provide you with a wide assortment of coupling products such as metallic bellow couplings, bellow coupling and flexible bellow couplings. Our products include some of the finest features which make them better than those provided by our competition. Moreover, people who have used our bellow couplings and spares have time and again commented on the sheer efficiency of functioning and the high level of performance that they provide. It is therefore no wonder that plenty of people prefer to use our bellow couplings & spares when they are looking to enhance the value of their operations. Each and every bellow coupling and spare part that we manufacture is tested for the optimum level of efficiency. We use only some of the finest handpicked raw materials to create these products. They are highly sensitive and can easily detect and absorb even small misalignments that occur between mounting shafts of the two components. They are perfect for being used in applications that involve high precision positioning. So whether you are looking for standard or custom variants of bellow couplings and spares, simply contact us at Nishi Enterprise for the best solutions.